mammals, with smarts that rival our own primate relatives. another branch of the mammal family tree – ours. It went through similar bursts of accelerated evolution in the great apes, and especially in our own ancestors after they split away from chimpanzees. who studies the genetic evolution of whales at Wayne State University. … continue reading at Not Exactly Rocket Science. Note: it is one of the microcephalin genes, if you wondered. There is hardly any more iconic animal than the dolphin but there is also hardly any animal closer to us in a key identity element: intelligence. Lacking hands and living in water, dolphins have never developed some of the technological landmarks that we associate with human-like intelligence: fire management and tool creation, however their brains are, in comparison to body mass, very much our size, they demonstrate once and again to be very intelligent beings with some abilities (notably sonar perception and communication) rather beyond our comprehension. For instance only recently have we begun to understand that dolphin language is not framed in the mere two dimensions ours is but is actually tridimensional. A few weeks ago, it came out in a discussion on “Neanderthals and us” whether dolphins, with their many different species, many of them (if not all) showing striking intelligence, could be a model to understand the relations between the various species of the genus Homo in the past. A problem, at least for me, is that we really do not know so much about dolphins either anyhow. Most documentaries are about the successful common bottlenose dolphin Tursiops truncatus or the also very successful and impressively bright orcas. But there are dozens of dolphin species. Julia T. Vilstrup et al. 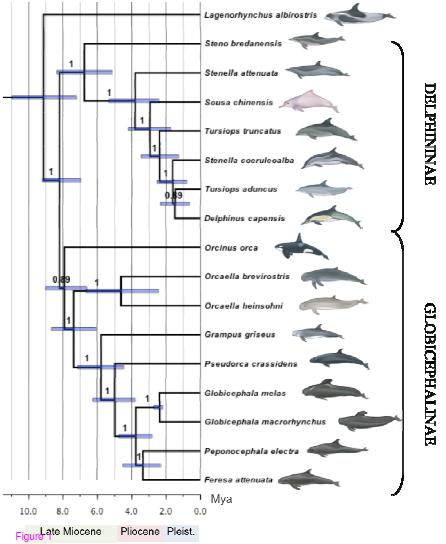 Mitogenomic phylogenetic analyses of the Delphinidae with an emphasis on the Globicephalinae. BMC Evolutionary Biology, 2011. Open access. It is notable that there are cases of hybridization (fertile hybrids!) in the wild as in captivity, of such different species as Turiops truncatus and Pseudorca crassidens, which would have diverged some 8.5 million years ago, roughly the (true) distance between chimpanzees (and bonobos) and us. This really challenges the concept of species as defined in classical terms (absolute possibility of production of fertile hybrids) and reinforces the modern revised concept (normal reproduction in the wild). The closest equivalent (always assuming all age estimates are correct) of “Neanderthal and us” (i.e. Homo ergaster and derived species by most accounts) in the tree above would be the relation between the long-beaked common dolphin (D. capensis) and the Indo-pacific bottlenose dolphin (T. aduncus). Just a little bit upstream and we get to the equivalent of all the Homo genus, while the overall dolphin relationships are in the range, as already mentioned of “Chimpanzees and us”. Probably this phylogeny will not be of much use for comparison, more so as the various intelligence levels and other cognitive, linguistic or social adaptions of dolphins are ill understood at the moment, but it is still better than nothing and hence I felt it was an interesting reference to have in mind.